Nikon's D7000 features a high resolution 16.2 MP DX-format CMOS sensor, high speed 6 frames per second continuous shooting and breathtaking Full 1080p HD Movies with full time autofocus. 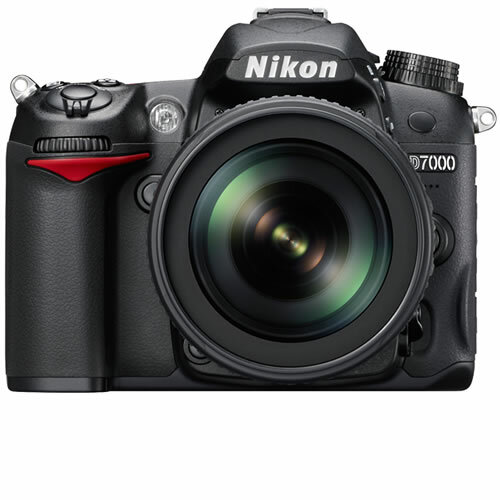 Engineered as an ideal balance of durability and functionality, the D7000 features a multitude of new enhancements and updated Nikon technologies to help photographers produce exceptional photos and full 1080p HD (High Definition) movies. Continuing the tradition of innovative technology that began with the revolutionary D90, the first digital SLR to capture HD movie, the D7000 features a new 16.2-megapixel CMOS sensor with low-light ability never before seen in a DX-Format (APS-C) camera. The new EXPEED 2 ™ image-processing engine fuels the enhanced performance of the D7000 along with a new 39-point AF system and groundbreaking new 2,016 pixel RGB 3D Matrix Metering System to deliver amazing image quality in a variety of shooting conditions. Additionally, the D7000 provides full 1080p HD movie capability with full-time auto focus (AF), enabling users to capture their world with both striking still and moving images. At the heart of the D7000 is a DX-format CMOS image sensor with 16.2 effective megapixels, optimally engineered to gather more quality light through sharp NIKKOR lenses. With 14-bit A/D conversion (12-bit selectable) operating within the sensor, the D7000 realizes stunning images that are richer in tone and detail than previously possible in DX format without sacrificing shooting speed or energy efficiency. Combine these with the agility of the DX format and its signature 1.5x focal length telephoto potential and you can begin to see where this kind of shooting power can take you. New image-processing engine "EXPEED 2"
The D7000 employs the new image-processing engine "EXPEED 2". This achieves higher-performance noise reduction, improved color reproduction, high-speed image processing and enhanced movie-processing performance and efficient energy saving with a smaller engine chip than that of the D90. And there is no reduction in continuous shooting frame rate even when high ISO noise reduction or Active D-Lighting is activated. The ISO sensitivity range of the D7000 is wide, from ISO 100 to 6400 at normal setting, and it can be raised up to Hi 2 (ISO 25600 equivalent). Highly improved noise-reduction technology reduces spotted color noise while maintaining resolution. The D7000 lets you select a faster shutter speed and expands creative possibilities in lowlight situations and sports scenes without worrying about image-degrading noise. Nikon's exclusive Active D-Lighting offers the ability to preserve details in the highlights and shadowy areas of images shot in high-contrast scenes such as those that are backlit. ADL levels are selectable from "Auto", "Extra high", "High", "Normal", "Low" and "Off". The D7000 employs a new image-processing system that produces less color phase shift even when the ADL level is increased. Furthermore, it realizes high-speed, real-time processing with high accuracy within image-processing pipelines. The D7000 also allows you to bracket for up to 3 frames. Scene Recognition System precisely reads the situation of the subject before shooting and delivers highly accurate auto control. It utilizes a newly developed 2,016-pixel RGB sensor to analyze brightness and color information of a scene and applies this to autofocus, auto exposure, i-TTL flash control and auto white balance for accurate control. Also, the D7000 detects up to 35 human faces utilizing image sensor when using face-priority AF during Live View and movie recording, and playback zoom of people's faces of still images. The D7000 incorporates Multi-CAM 4800DX autofocus sensor module. It detects and tracks the subject precisely with 39 focus points. Nine cross-type sensors cover the most frequently used center area to deliver higher subject-acquisition and focusing performance. There are selectable AF area modes according to the scene - single-point AF, dynamic-area AF (9 points, 21 points and 39 points), 3D-tracking and auto-area AF. You can also choose to shoot with 11 focus points. With Scene Recognition System that recognizes more detailed information utilizing finer-segment 2,016-pixel RGB sensor, the D7000 shows higher subject-tracking and subject-identification performance. Ideal for stationary subjects. Camera focuses on the subject at a selected focus point only. Suitable for capturing moving subjects. If the subject briefly leaves the selected focus point, the camera will focus based on information from surrounding points. Pursues your subject using all 39 focus points. Once focusing is achieved with a selected focus point, the focus point automatically changes to track the subject according to its movement while the shutter-release button is pressed halfway. 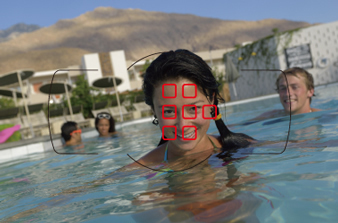 The D7000 detects the main subject using all 39 focus points and automatically focuses on it. With a G- or D-type AF NIKKOR lens, the D7000 can distinguish foreground and background using "subject identification" of Scene Recognition System and detects a person's position by recognizing human skin tone for improved subject acquisition. Note: Only the selected focus point is shown on actual images. Also, if you select focus points in a peripheral area of an image when [9 points] or [21 points] is chosen, the number of focus points actually used may be less than 9 or 21. The 2,016-pixel RGB sensor detects highlights within a frame precisely. It calculates optimal exposure to deliver more accurate auto exposure control and i-TTL flash control. The D7000's intelligent auto white balance algorithm renders white as truly white even when shot under a wide range of light sources, including mercury vapor light. The D7000 analyzes color and brightness information of the scene before shooting utilizing Scene Recognition System, and detects the light source highly accurately by referencing its massive collection of in-camera shooting data. The D7000 also carries another auto white balance mode that maintains warm lighting ambience when you shoot under incandescent light. 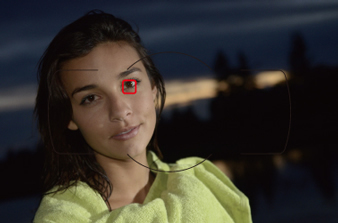 With approximately 100% frame coverage in the viewfinder, you see what the D7000's image sensor sees. The specially coated glass pentagonal prism offers not only a bright viewfinder image, but it also enables you to easily confirm a subject. 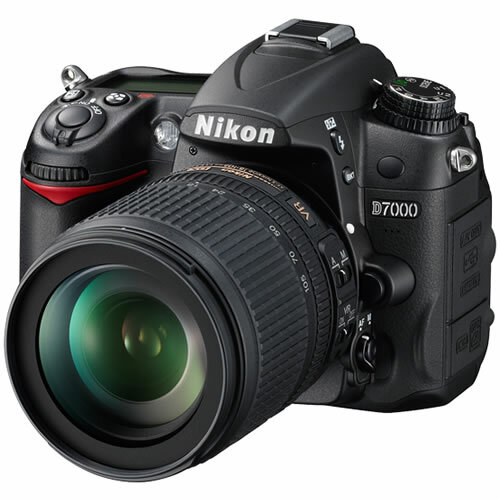 The D7000 incorporates newly developed shutter, aperture and mirror driving mechanisms. Combining with higher image-processing speed, high-speed continuous shooting at approx. 6 fps, for up to approx. 100 shots* is achieved. Start-up time is only approx. 0.13 s** and release time lag is approx. 0.052 s**. All this gives you stress-free, comfortable shooting, helping you to capture the decisive moment. * *With 8 GB SanDisk Extreme SDHC memory card, JPEG (image quality: NORMAL, image size: L) images. * **Based on CIPA Guidelines. In a compact size of approx. 132 (W) x 105 (H) x 77 (D) mm (5.2 x 4.1 x 3.0 in. 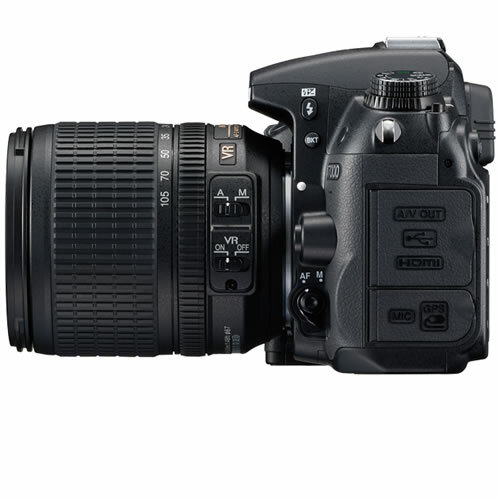 ), the D7000 employs light and rugged magnesium alloy for top and rear covers for high durability. Furthermore, connected parts and various points are securely sealed, achieving superior weather-resistant and dustprevention performance. The D7000 adopts double SD card slots, enabling you to select from options: "Overflow" recording lets you use the memory capacity of the secondary card when the primary card is full, automatically; "Backup" recording stores the same images on both cards; and "RAW primary, JPEG secondary" recording lets you record RAW data and JPEG data separately to each card. You can also copy images between the two memory cards. Furthermore, when shooting D-Movie clips, it allows you to select the slot according to the remaining capacity. Compatible with SDXC. The following table shows the approximate number of pictures that can be stored on a 8 GB SanDisk Extreme SDHC card at different image quality and size settings. 1. All figures are approximate. File size varies with scene recorded. 2. Maximum number of exposures that can be stored in memory buffer at ISO 100. Drops if Optimal quality is selected for JPEG compression or long exposure noise reduction is on. 3. Figures assume JPEG compression is set to Size priority. Selecting Optimal quality increases the file size of JPEG images; number of images and buffer capacity drop accordingly. 1. Check that any card readers or other devices with which the card will be used support 2 GB cards. 2. Check that any card readers or other devices with which the card will be used are SDHC-compliant. The camera supports UHS-I. 3. Check that any card readers or other devices with which the card will be used are SDXC-compliant. The camera supports UHS-I. The D7000 has a shutter speed range of 1/8,000 to 30 s, with a top flash synchronization speed of 1/250 s. And just like with the D300S, the shutter unit is tested for 150,000 cycles tested in severe conditions to prove precision and durability. You can reduce the sound of mirror-up and mirror-down during shooting by selecting "Q" on the release mode dial. This improved quiet shutter-release mode is a convenient function for scenes such as a school play or when shooting wildlife insects and sleeping child. The D7000 achieves excellent low power consumption by adopting the new image-processing engine "EXPEED 2" and newly developed driving mechanisms. The Rechargeable Li-ion Battery EN-EL15 (supplied) allows you to shoot up to approx. 1,050 shots* per charge. * *Based on CIPA Standards. You can set frequently used options, for example, Picture Control, exposure compensation, etc. on user setting modes "U1" and "U2" on the mode dial, coaxially located with the release mode dial. Nineteen options of scene modes, such as silhouette, high key and low key that are selectable by setting the mode dial to SCENE, enable you to shoot more easily. The D7000 offers smooth switching from regular shooting to Live View shooting with the dedicated Live View switch. Large, easy-to-view 7.5 cm (3-in.) VGA wide-viewing-angle (170°), approx. 921k-dot TFT LCD monitor with reinforced glass realizes comfortable Live View shooting. The D7000 also allows contrast-detect AF. By selecting AF-F (full-time-servo AF), the camera automatically tracks the subject continuously even if it moves during Live View shooting. There are selectable AF-area modes according to the subject; face-priority AF, wide-area AF, normal-area AF and subject-tracking AF. You can display Virtual Horizon that enables instant confirmation of your camera's position relative to horizontal level. During Live View, the virtual horizon is superimposed on the monitor image. Also, a virtual horizon indicator is displayed in the viewfinder to show horizontal inclination of the camera. Flicker reduction function reduces the flicker effect that might occur under fluorescent or mercury vapor lighting while using Live View or D-Movie. You can select 50Hz or 60Hz, according to the local power frequency where you are shooting. Suitable for a stationary subject. Focus is locked when the shutter-release button is pressed halfway. Suitable for a moving subject. AF is activated and tracks the subject continuously, immediately after Live View or movie recording starts without pressing the shutter-release button halfway. Note: Manual focusing is also available during Live View or movie recording. The D7000 gives you a variety of playback display options that take advantage of the large 7.5 cm (3-in.) monitor. The number of images displayed at any one time can be selected from 1, 4, 9 and 72, and calendar display arranges images in chronological order. You can also display a histogram of a magnified area of an image and check the focus using playback zoom of face. You can confirm shooting information and settings such as shutter speed, aperture, number of shots remaining and AF-area mode by pressing the [info] button. The color of characters can be selected according to lighting conditions, dark on light (black lettering) for bright locations or light on dark (white lettering) for dark locations and auto mode for automatic switching of lettering according to lighting conditions can also be set. Pressing the [info] button again when shooting information is displayed gives you direct access to the menu of the setting you would like to alter. Note: All indicators appear on the images above for demonstration purposes. 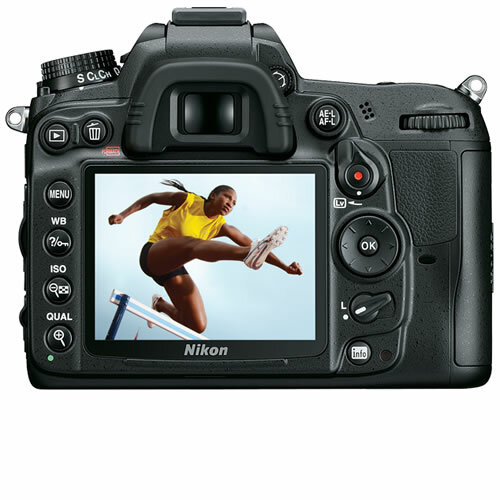 The D7000 employs Nikon's Integrated Dust Reduction System, which includes the Image Sensor Cleaning function that vibrates the optical low-pass filter with four different resonant frequencies to reduce dust. It prevents unwanted spots from appearing on your images. This function can be set to operate automatically when the camera is turned on or off, or to manual. 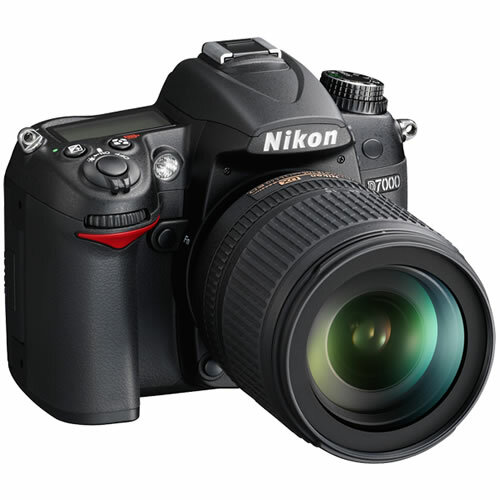 The D7000 offers high-image-quality full HD movie recording of 1,920 x 1,080/24p. You can shoot creative and beautiful movies taking advantage of shallow depth of field and a variety of interchangeable NIKKOR lenses. As with Live View, contrast-detect AF is possible. And if you set full-time-servo AF (AF-F) for AF servo mode and subject-tracking AF for AF-area mode, AF area tracks even a moving subject continuously and three-dimensionally. During movie shooting, the D7000 lets you record not only monaural sound with the built-in microphone, but also stereo recording using an optional external microphone. You can also select the sensitivity level for either the built-in or external microphone, choosing from auto, high, medium or low. Select low for scenes in louder environments, such as a concert hall; high for quieter environments, with more delicate sounds, such as a murmuring stream. An external microphone also allows you distance it from any sound generated by the camera such as lens movement during autofocus shooting, or VR operation when the VR function is activated. Easy in-camera movie editing is possible without a PC. You can delete unwanted parts by choosing the start or end point by frame, and save a selected frame as a JPEG image. Nikon's Picture Control System allows you to customize sharpness, saturation and other parameters to match your preferences. 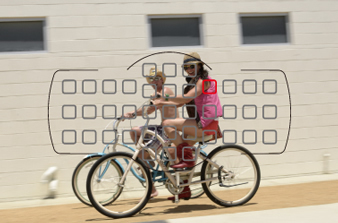 Picture Control can be adjusted and saved, and also shared with other cameras compatible with Picture Control System. A variety of flash shooting can be achieved by combining with optional Speedlights such as the SB-900, SB-800, SB-700, SB-600, SB-400 to expand your creativity. The built-in flash featuring a guide number of approx. 12/39 (m/ft., ISO 100, 20°C/68°F) and a wide-angle 16mm lens coverage works as a wireless commander. It controls up to two independent groups containing an unlimited number of remote Speedlights in Advanced Wireless Lighting. This enables easy in-camera image editing after shooting. The D7000 creates an edited image, while leaving your original shot intact. The D7000 supports HDMI (High-Definition Multimedia Interface), that enables direct connection to a High-Definition TV for viewing of still images and movies. Type C connector (mini size) is employed and also HDMI-CEC (Consumer Electronics Control) is supported for operation of the D7000 using TV remote control. Note: Requires optional HDMI connection cable [HDMI Type A ? Type C (mini size)] for playback. ViewNX 2 provides importing and browsing capabilities of images, and incorporates frequently used image-editing functions such as resize and brightness adjustment. ViewNX 2 newly employs crop, straighten, etc. as well as movie-editing functions equivalent to those of the D7000. In addition, coordination with Nikon image storing and sharing service, my Picturetown, is realized. This all-in-one browsing/editing software package will let more photographers enjoy digital images, more easily. 16.2 megapixel DX-format CMOS image sensor delivers lifelike images with vivid colours, reduced noise and smooth tonal gradations. High ISO (100-6400) light sensitivity - manually extendable up to 25600 using the Hi2 setting. Enables faster shutter speeds for finely detailed images with minimal noise when you shoot fast-moving subjects or take pictures in low light. Features an Auto ISO setting. EXPEED 2 image processing engine: optimizes the camera's technologies for superior performance and maximum image quality, all while consuming minimal energy. Durable design: boasts tough, yet light, magnesium alloy top and rear covers, and environmentally-sealed joints that protect the camera from dust and moisture. Durable shutter unit tested to 150,000 cycles. Delivers precise shutter control and exceptional reliability with a shutter speed of up to 1/8000s, and flash synchronization at up to 1/250s. Twin SD memory card slots: for enhanced shooting flexibility. Use the second card when the first is full, or record stills on one and movies on another. SDXC compatible. Built-in Speedlight flash with i-TTL and Wireless Commander support so you can light your subjects any way you like. 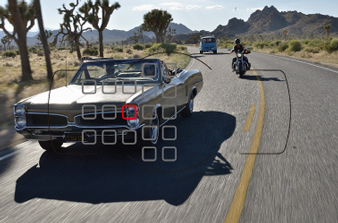 Razor-sharp 39-point Autofocus system with nine cross-type sensors in the centre. Offers fast and precise autofocus coverage across the frame. 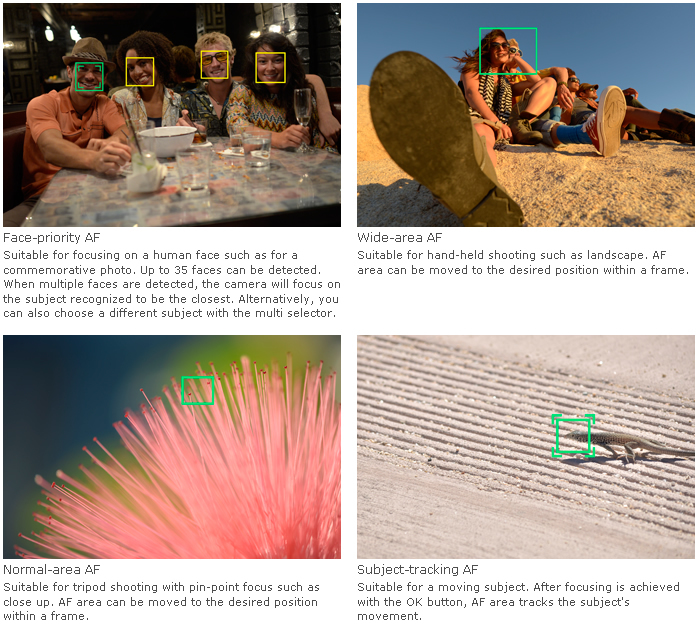 Four AF-area modes, including 3D-tracking AF, deliver sharp results, whether your subject is off-center, moving fast or completely unpredictable. 2,016 pixel RGB metering sensor delivers highly accurate metering for exact exposures and provides precise data to the camera's Scene Recognition System, which optimizes exposure, autofocus and white balance immediately before the shutter is released for sharply defined images. 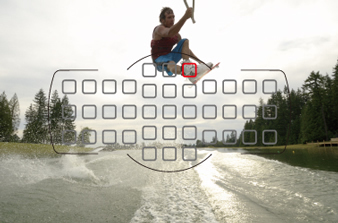 6 fps continuous shooting: capture fast-moving action at six frames per second. Quick response: boasts a near-instant start-up time and approx. 0.052-second shutter-release time lag. 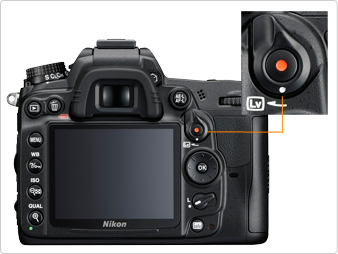 Two User Definable Settings (U1, U2) right on the Mode Selector Dial let you store most camera settings so you can go back to them at anytime without the need for further adjustments or menu settings. D-Movie – full HD (1920 x 1080) movie clips: a dedicated record button lets you capture beautiful high-definition (HD) movie clips instantly. AF-F mode keeps everything in focus while you are shooting and the camera supports use of an external microphone so you can record in quality stereo sound. Simple editing functions let you make edits of your clips in-camera. Large 7.5 cm (3-in. ), 920k-dot, high-resolution LCD monitor with reinforced glass makes it easy to view essential camera information, and a pleasure to review and edit your photos and movies. Compact but durable with magnesium-alloy top and rear covers, superior weather and dust seals and a 150,000 cycle-rated shutter system providing reliable operation.